The full Volkswagen board is to meet on Friday, when it was supposed to sign off on a contract extension for CEO Martin Winterkorn though 2018. FRANKFURT/BERLIN (Bloomberg) -- Volkswagen CEO Martin Winterkorn was preparing to build the Passat at a new $1 billion U.S. factory and was not pleased. Visiting the Tennessee site before the 2011 opening, he berated staff for hanging chrome parts for air vents, doors and gear shifts on the wall. To check that they uniformly glistened before agreeing to use them in the sedan, he wanted them displayed on a table with light shining down at the same angle that customers would see the parts in the car. Known to measure gaps between metal parts and laud the MontBlanc pen-like finish on plastic parts of the Golf hatchback, Winterkorn’s focus on details is legendary in the industry. With the world’s biggest carmaker facing a U.S. criminal probe for cheating on emissions tests, it’s now coming back to haunt him. The timing is delicate for Winterkorn. He was consolidating authority after surviving a power struggle with his former mentor and VW patriarch Ferdinand Piech, who tried and failed to oust Winterkorn in April. Part of Piech’s criticism was VW’s struggle to compete with Ford, GM and Toyota in the U.S. But Winterkorn’s successes, including boosting deliveries 77 percent and catapulting Volkswagen to the No. 1 spot globally, proved too much for the once-invincible Piech, who resigned. While the 68-year-old CEO said on Sunday that he was “deeply sorry” and promised a thorough investigation, he didn’t specifically comment on his role. That uncertainty puts him on the hot seat as top supervisory board members gather on Wednesday. The full board will meet on Friday, when it was supposed to sign off on a contract extension though 2018. VW declined to comment and referred back to Winterkorn’s statement. Volkswagen executives convened by phone over the weekend to discuss the “defeat device” uncovered by clean-air researchers. In a tense exchange, blame was passed around, but no one asked Winterkorn whether he knew about the software, according to a person familiar with the conversation, who asked not to be identified because the talks were private. The tumult followed the U.S. Environmental Protection Agency disclosure on Friday that the automaker had cheated on air-pollution tests and covered it up for almost a year. As a result, the company faces fines of as much as $18 billion. The U.S. Justice Department is also conducting a criminal investigation, according to two U.S. officials familiar with the inquiry. While the U.S. probe focuses on a relatively small number of cars for a company that sold more than 10 million vehicles last year, the admission that VW’s technology wasn’t as good as claimed undermines the company’s well-crafted image for reliable, cutting-edge German engineering. Last week at the Frankfurt International Motor Show, Winterkorn boasted about the automaker’s technological prowess and how it plans to adapt to an era of self-driving, digitally connected cars. “We are taking the precision, enduring value and quality of our cars into the new, digital world,” said Winterkorn, who’s run Volkswagen since 2007. The cars targeted by the EPA’s probe include VW and Audi vehicles for the 2009-15 model years. VW halted sales of those cars in the U.S. on Sunday as it grappled with the fallout of the scandal. Decision-making at Volkswagen is highly centralized. 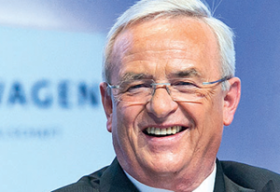 Winterkorn and a couple dozen managers vet product plans in Wolfsburg, including detailed lists of components that differentiate between new and standardized parts. Winterkorn was aiming to loosen that structure by pushing more authority to brand and regional managers. That reorganization was due to be approved by Volkswagen’s supervisory board on Friday, along with his contract extension. That may now be up in the air. Stephan Weil, the prime minister of Lower Saxony, which owns 20 percent of VW’s voting shares, said the company must act swiftly to clarify its actions to circumvent air pollution tests and warned that “possible consequences” may follow. Weil also sits on the supervisory board.